The Lock (formerly known as The Lock XP) is a user auditing and monitoring tool for various versions of Windows including Windows XP, Windows 7 32-bit and indeed the newest 64-bit versions of Windows. The Lock facilitates PC auditing and HIPPA, Access and Authorization including Security control within the OS. Security auditing performed the The Lock is defined by users who are part of certain groups including the members of Windows' Administrator group. The Lock allows administrators to define key system policies, allowed login times, times which Internet access is permitted and more. 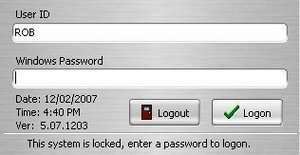 The Lock 5.11.0101 is a shareware program and can be used as a demo to try the software until the free trial period has ended. A full version of the program is available after the trial period ends. For security reasons, you should also check out the The Lock download at LO4D.com which includes virus and malware tests. Additional screenshots of this application download may be available, too.